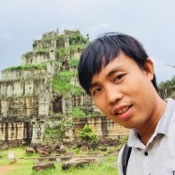 TOUR GUIDE RESPONSE: Hi David, Happy New Year from Cambodia. I wish you all the best. John. John was great guide I am agent for group of 10 travelling together We all thought dY was great. John knew special spots for best pictures. Only issue is that he is soft spoken and difficult for all to hear. He is lovely. Just have to stay close and ask to repeat sometimes. I would hire him again great couple days!! A good tour. The Floating Villages were something we could not have imagined. What a very different life style from anything we've ever known. The tour off the water was interesting, but not that exciting for us. Our guide did an excellent job of meeting my needs (Patricia) when on the water. He was very kind. I appreciated that. He was able to answer all our questions. His ability to do this definitely made the land tour more interesting. We chose a jeep tour - loved the jeep. Cold water & towels. TOUR GUIDE RESPONSE: Hi Patricia, thank you for your sweet words. We were really pleased to meet such nice people with you both. All the best to you. Best regards, John. This was a fantastic tour! John was a great guide, spoke English very well, and knows his city. Very interesting to see the everyday life of the locals. John drove us in his own restored vintage army Jeep, which made it extra fun. Highly recommend both this guide and tour! TOUR GUIDE RESPONSE: Hi David, thank you so much for your kind recommendations. Of course, we keep doing good job to make everyone learn about our country and have fun here. Chamrouen was great. Knowledgeable, informative, pleasant, and an overall excellent guide. Also a genuinely nice person. Great two-day tour. One of the best guides we've ever had in our life! John is highly knowledgeable about the history and is very fluent in communication. He provided us with refreshing cold water and towels when needed. Not to mention that he is a wonderful person. We highly recommend him as a guide for anyone. TOUR GUIDE RESPONSE: Hi Raj, thank you for your heartfelt admiration. It’s my great honor to have served and guided you all to see my beautiful country. Hope to see you again. John did a great job of showing us Angkor's best.We learned so much it was amazing. Thanks!! TOUR GUIDE RESPONSE: Dear Craig, it's my pleasure to have shown you around and my great honor to have chosen as your guide. Orkun Thom Thom, thank you enormously that you are willing to show Cambodia to the world with your smile and Cambodia flag on your photo. See you again. For our first trip back to Siem Reap in 16 years, we wanted to revisit our favorite temples and also see some new sites. Chamroeun was the perfect guide! We started with the well traveled sites and then over the course of three days, went out to more remote sites including Beng Mealea, Koh Ker and finally Banteay Chhmar. He was incredibly knowledgeable about the history of the Angkor Empire and each site in particular. He and our very courteous and safe driver were very thoughtful in every way! TOUR GUIDE RESPONSE: Dear Courtney, it was my pleasure and privilege to be your guide. We really appreciate your presence of choosing to revisit our country. We hope to see you again some day. Este tour con John (Chamroeun) en español y el conductor Sophona las Montaña Kulen y Beng Mealea es muy recomendable. Como John habla un buen español puedes descubrir el arte, los templos y la vida cotidiana auténtica alrededor de Siem Reap. Muy recomendable hacerlo el segundo día, después de Angkor Jeep Adventure. Logística perfecta y buena comida de la zona. John es muy atento, profesional yes uno de los pocos guias en español!! TOUR GUIDE RESPONSE: Hola Macrina, Muchísimas gracias por tus opiniones. The full-day Angkor Jeep Adventure Tour with John is a"must do" for first-time visitors. My family enjoyed the experience very much. John is a knowledgeable attentive guide with excellent English and Spanish. He has the flexibility you expect in a high-level private tour guide (he added Beng Maelea visit, after knowing we were unable to go any other day.). He brought a level of service that went above and beyond. Logistics (time pick-up, wáter supply, photography suggestions,etc.) where great. A 5/5 star! Tour is highly recommended. John took us to some lesser known spots away from the crowds.